Behind the Scenes: 'Room With A View' at Andaz Liverpool Street Hotel | StyleAble Fashion For Everyone! Inspired by the culture of its locale since inception, London’s 5 star luxury boutique, Andaz Liverpool Street hotel have launched a series of four East London street art rooms. 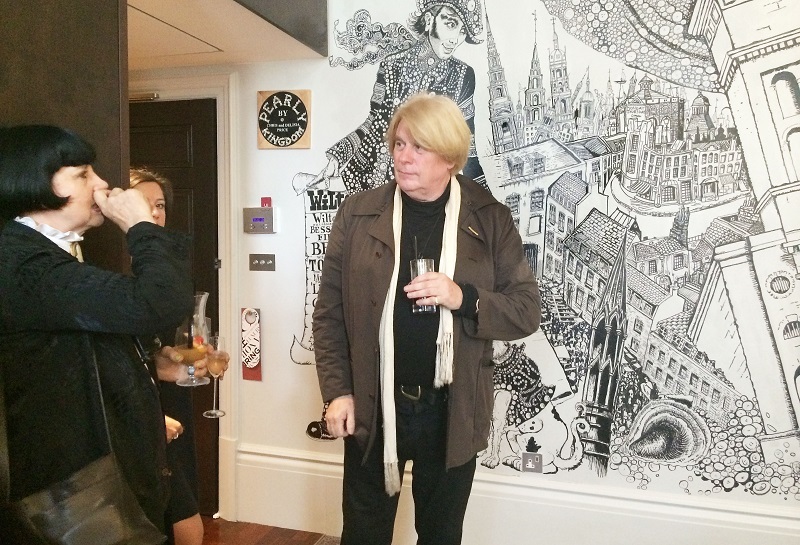 Andaz has teamed up with four distinctly diverse British artists: Chris Price, Patrick Vale, ILoveDust and Patrick Morgan. Each artist will hand paint in four of the hotel’s luxurious Large King guest rooms, to depict their interpretation of East London’s past, present or future. By Khutina Griffiths. Chris Price and his wife and collaborator Delisa Howard are instantly noticeable – they have a distinct presence and style about them. Chris and Delisa are from a nostalgic time, a time which links the East End of London with its cockney roots, and which they pay homage to with ‘The Pearly Room’. Chris’ Black and white illustrations are of iconic East End landmarks and they fill the space between a life-sized pearly king and queen decked out in their finest – including hundreds of hand drawn pearls. A swooping pearly sun rises over bustling markets, churches and music halls which have all been drawn in painstaking detail. The Andaz has a small dark unassuming entrance, but once inside, it opens up into a mini city that screams 5 star luxury. This is a far cry from the humble origins of the East End cockney, sewing pearls on his suit to hide his poverty!